NEW PRODUCTS: Carbide Square End Mill – 1/8″ Shaft – 0.5mm/0.6mm/0.7mm/0.8mm Diameter « Adafruit Industries – Makers, hackers, artists, designers and engineers! 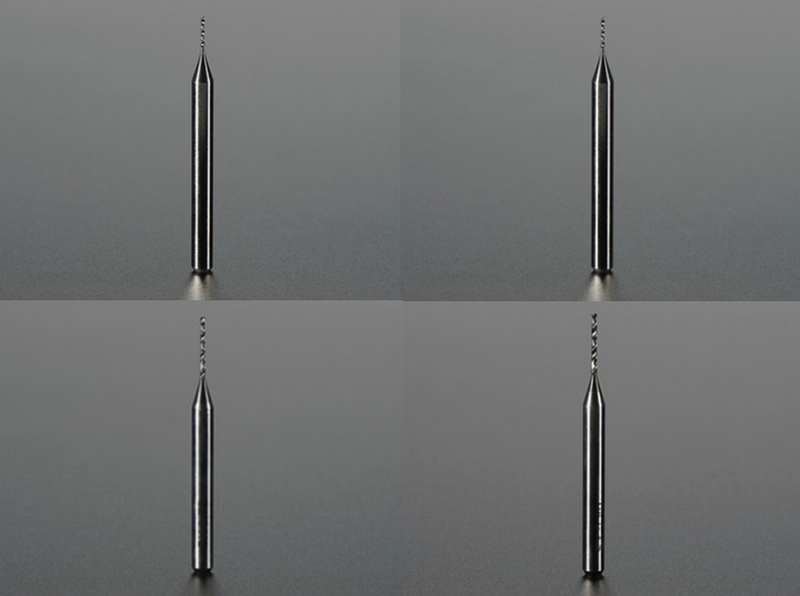 While we already carry PCB drill bits, end mills are slightly different. Drill bits can only cut in an axial direction, meaning in line with the axis of the bit – or up and down on the PCB. End mills can move in any direction so you can drill side to side, up and down, etc. These end mills are made from carbide (tungsten steel) and are suitable for circuit board cutting and probably some other soft metals and other materials. Each endmill has a high hardness, wear resistance and strength and they’re also super sharp which helps when cutting thru PCBs. These mill bits have a fairly long flute, about 8mm. While this is a bit longer than we are used to, we have found that the bits work quite well and are low cost enough to replace if they break. Note that even carbide bits will dull eventually when cutting PCBs, we found we could cut for about 5 hours on each bit before we find they need replacing.